Do you need a simple and versatile RFID solution? If so, you should check out the pcProx USB RFID reader module from RF IDeas. Requiring no programming and no software, it's the quickest way to implement the security and convenience of RFID technology into your project. It acts as a "keyboard wedge," inserting an RFID tag's unique serial number into any selected text field automatically when a tag is swiped near the reader. 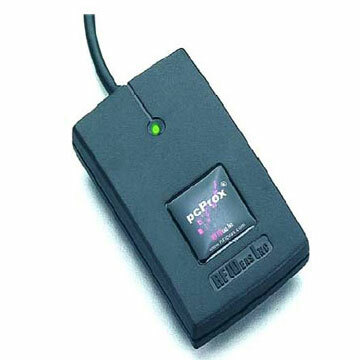 Instead of typing in a password, you can use the pcProx reader to log into your computer. Use it to streamline data entry and inventory tracking. It also works great as a drop-in replacement for many barcode scanners. Using the intuitive configuration utility, you can also format the output; omitting digits from the tag ID or adding characters such as Tab and Enter. Check out the pcProx RFID reader module in our store for more information! We also offer this reader in a kit, which includes an assortment of 125kHz (EM4102) RFID tags. If you're not sure which tag will be best for your application, why not get the kit and test them all out? In this increasingly technologically saturated world, electronic communication has become a vital part of our lives. Communication between sentient carbon-based life forms such as ourselves is fairly straightforward, but what about communication between the electronic devices that surround us? Making Things Talk, a new book from the fine people who bring us Make Magazine, demystifies device level communications with a series of fun projects presented (as always) in a friendly, nonthreatening manner. If you haven’t checked this book out yet, we highly recommend it. You’ll learn how to make a video game out of a stuffed monkey, add a web cam to your cat, and by the time you’re done, you’ll be tracking your grandmother by GPS and your underwear drawer will be sending you status updates via email. It’s a good primer for all sorts of communication methods; from short range communication using IR, Zigbee, and Bluetooth, to communicating over vast distances over the Internet. It’s also a good way to get familiar with basic electronic prototyping, microcontrollers, and TTL-level serial communication. Making Things Talk is not an exhaustive encyclopedia, but more of a well-rounded cookbook. If you’re a beginner, it will help you get your feet wet. If you’re more experienced, it should still teach you a few new tricks. 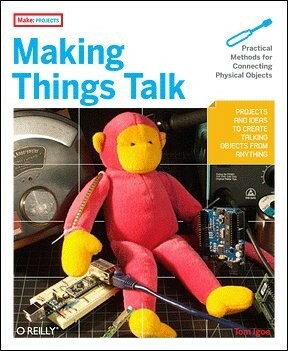 Buy your copy of Making Things Talk at the Make store.